Navjot Arora, Executive Chef and co-owner of Chutney Masala Indian Bistro, grew up in Jalandhar Punjab, India, and graduated from one of the country’s most prestigious culinary schools, the Institute of Hotel Management in New Delhi. He then completed a management training program at the Taj Group of Hotels in India where he received numerous awards and trained the incoming students. Arora and his wife, Anu, moved to New York City where he put to work his experience and passion for healthy Indian cuisine as the Executive Chef of the critically acclaimed Café Spice Restaurant Group. Arora’s fascination with food began as a young boy when he was put in charge of preparing the mint chutney for the family’s evening meal. It required that he pick the fresh mint leaves from the garden and puree the ingredients using a mortar and pestle—a method he still employs to derive the most vibrant flavors from herbs and spices. 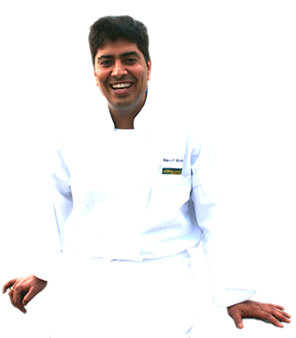 The following year the James Beard Foundation welcomed Arora as a guest chef. 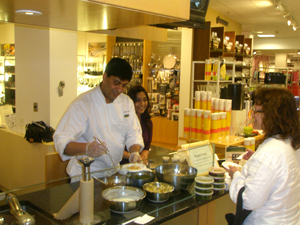 Committed to educating others about healthy Indian cuisine, Arora has extensive experience teaching cooking classes and food seminars. He has taught a series of cooking classes for Spoons across America, a not-for-profit program dedicated to teaching children, families and teachers about the benefits of healthy eating. Currently, Arora is a guest chef for the Inter-Village Continuing Education program in Ardsley, New York and had collaborated with the social service organization, the Abbott House, to train youth in the culinary arts—the first-ever program of its kind for the agency. In the fall Navjot will conduct cooking classes at the Westchester Community College. 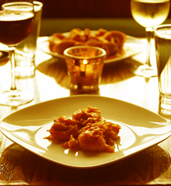 Chutney Masala Indian Bistro is located at 4 West Main Street, Irvington, New York.